It’s always a breath of fresh air and a hit of real sanity (not the fake sanity that the conventional world offers) to visit San Francisco. On last week’s visit, my good friend Linea told me about Critical Mass. This isn’t a physics discussion, it is an “organized coincidence”, where over 2,000 cyclists take over the streets on the fourth Friday of every month. Since then the movement has spread to over 300 other cities around the world. It is described variously as an intentional community, a way to connect with others “outside the steel box” of your car, and a way to raise consciousness about alternate means of transportation. It is testament to the power of single-minded groups. When they sweep through the city, they become a rolling force field. Critical Mass creates its own momentum and affects the momentum of the whole city. While they are crossing town, traffic stops as signage and stop lights are ignored. The riders are fully regaled, text-messaging madmen (and -women) for their cause. It Also Happens to Fire. When the wildfires swept through southern California in 2003 and again in 2007, I learned something chilling about fire: When it’s big enough and bad enough, it creates its own weather. The heat causes dramatic updrafts that shift and intensify winds, until fire storms develop. They consume the countryside in giant gulps, throwing huge whirling balls of flame into the air. The fire creates whirlwinds, cyclones, and smoke that fills the sky with darkness. Both wildfires and Critical Mass create their own weather, and they exhibit for us an important physical and metaphysical law: We can do it too. We find ourselves in the midst of the most significant planetary pattern since the triple conjunction of Saturn-Uranus-Neptune in 1988-92. The new triple conjunction of Jupiter-Chiron-Neptune opens the door to healing the Great Wound within us, on all levels from the most personal to the lesson(s) that all humanity needs to learn. We will see this played out in political ways, from the nomination of Sonia Sotomayor for the Supreme Court to the launching of a nuclear test by North Korea as attention-seeking behavior. We will reveal our wounds so we can heal them. (To experience the link between wounding and healing in an evocative way, see the short video on Chiron by Humanity Healing. As we encounter these lessons, from dreaming a new economic model that supports the people to living sustainably on the planet to learning to love one another, we can create our own weather. We can do it as individuals, but we can do it most effectively in community. This conjunction of planets is found in Aquarius, the sign of community and the sign of the new/next Age of Humanity. Under this pattern, which starts a 13-year, a 14-year, and a 100+ year cycle, we will find ourselves drawn to form community with like-minded individuals. Like Critical Mass, and like the firestorms of southern California, we will shift and flow, creating our own weather, our conditions of reality that others will adapt to — not in a malevolent way as with the fires, but in a joyful and live-affirming way. This is the model for change that we will find ourselves thrust into, drawn effortlessly into the flow of the good and the true. There is a quiet orchestration occurring right now in the heavens, a celestial conspiracy to create harmonic resonance in the human consciousness at the 27th degree (anything over 26̊00'). It is at once perilous, powerful, and beautiful, with the potential to lift us up out of ordinary consciousness and create miraculous change. To get at what’s going on here, we have to look at the contributing planets and their cyclic interactions. 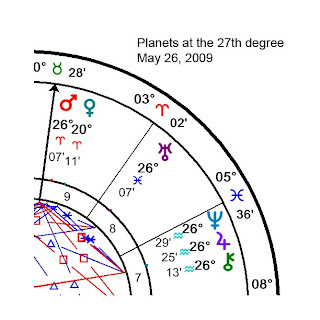 From May 21 through June 10, four slow-moving planets will be at 26 degrees and change in their respective sign: Uranus (Pisces) and Jupiter-Chiron-Neptune (Aquarius). On May 26–27, Mars joins them from its position in Aries, boosting the chance of a harmonious human response. (See image above.) They will all be vibrating on the same “note” of the 12th harmonic, and this opens the door to profound change. It also allows us to check in on changes we began as a human collective in 1992. The entire time that any of these planets is at this degree spans a broader expanse of time from April 14 through August 10. Since every planet but Mars backs off this degree, they will return to it later but in a dispersed form, with Jupiter reaching it first at the end of December, Chiron-Neptune connecting at that degree in February, and Uranus reaching it in March. This suggests that, whatever comes up now feels like a now-or-never “crunch time” that we must respond to urgently; and that a more dispersed and gentle resolution to the issues that develop will come about early in 2010 — that is, if we respond well to those issues. At first glance, this means that any person, group, leader, or nation that has planets at this degree will be transformed by these energies. It also means that issues that began showing up in April will face turning points in the next two weeks, when critical decisions will be made. What issues are we talking about? This is a “hook” into the US chart, and it suggests issues that affect society and its well-being. 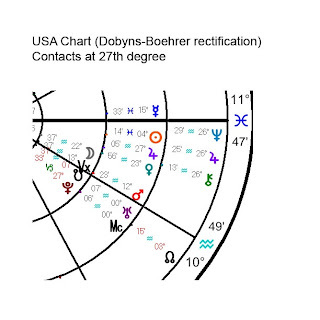 In the chart I use (Dobyns-Boehrer timed for 9:36 am), this falls in the 6th house of workers and the health of the nation. It suggests that we are not doing all that is necessary to support the engine of the US economy, its workforce, and that we are also weak in health (care). These must be rectified in order to live long and prosper as a nation. Accordingly, here are the matters that seem to tie in to the planets at the 27th degree. From Max Baucus’s one-sided meetings with insurers and big pharma (pointedly excluding proponents of single-payer plans) to President Barack Obama’s more universal approach, there is no doubt that health care is on the table and will be dealt with in some form in the coming months. If it follows this time table and is addressed wisely, we will see a new plan in place by the spring of 2010. We have to regulate. This may mean some reinstated or revised regulations (like breaking up the big banks — a MUST! ), or simply enforcing the regulations that are there (like the Sherman Act). 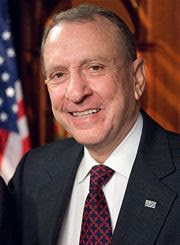 Nothing must be too big to fail anymore; and the Wall-Street mindset of Geithner, Summers, and the big bankers must be opened to consider what is happening to the people who are (currently still, sadly) their victims. It is beyond belief that so much money could be pumped into the financial industry and so little benefit (in fact, even more punishment) extend to the people. The banks (with some exceptions) remain adamantine in their disregard for the people who drive the economy and therefore their wealth. For more on what’s going on, stay tuned to Rachel Maddow, especially her May 12 interview with Eliot Spitzer, and read the blogs of Spitzer, Paul Krugman, William Greider, Robert Kuttner, and David Cay Johnston. Bill Moyer also covers this topic regularly on his Journal, as does Fareed Zakaria on CNN. Secretary of the Interior Ken Salazar is proving to be a Bushie in Obama clothing. He has refused to increase protections for the highly endangered polar bear and has allowed permits to go through for the mining of uranium near the Grand Canyon, a direct threat to the water supply of southern California, as well as the area surrounding the mining sites. These permits are currently being challenged in court. Directed Jupiter in Aquarius in the US chart can also signify the level at which people are direct participants in maintaining or (re)gaining their freedom. Transiting Jupiter’s retrograde station on this point could signify a necessary learning curve for the public in the need to become more actively involved in creating the world they want to live in. The alternative is for lobbyists to continue to be the driving force behind the direction the country takes. On a Deeper Level . . . There is so much depth and richness to this set of planetary interactions. There are three new planetary cycles beginning (Jupiter-Chiron, Jupiter-Neptune, and Chiron-Neptune), as well as a trigger to one that started in 1992. The latter is the Uranus-Neptune conjunction, which occurs every 171 years or so. The word on every tongue at that time was “reinvention”. What are we reinventing? Nothing less than the way humans live on the planet, the way we dream about our possibilities, and the ways we live, interact, and communicate with each other. Uncannily, the last time we considered real health care reform was in 1993, when Harry and Louise — a front for the Health Insurance Association of America (HIAA), a health insurance industry lobbying group — put the brakes on the Clinton health care plan. We get another shot at this now, as Uranus and Neptune resonate with each other once again. It gives us yet one more layer of awareness to make the right thing happen. Can we save ourselves? If this H1N1 outbreak follows the pattern of the one in 1918, the spring version of the influenza is mild. However, the following fall-winter, the outbreak was acute and deadly, and it killed the most healthy among the population. This was caused by a cytokine storm, where the immune system goes into hyper-drive and overwhelms the body so that it essentially drowns in its own immune response. There is evidence of heightened cytokinic activity with the current flu outbreak. The wisdom gained from the 1918 Spanish Influenza allows us to anticipate that the virus could become pandemic in the fall and winter — and this gives biologists time to come up with a vaccine. The vaccine could become available no sooner than October, and a question remains as to how effective the vaccine will be because of the trial-and-error nature of the process. In the fall, temporarily Saturn cuts its ties Uranus when it goes into Libra, connecting with Pluto at the end of the year. It then returns to Virgo to make two more connections to Uranus before leaving it behind. This is fodder for a more serious outbreak — and for humanity to get its public health act together. I have no speculations on what will occur, but we have an open window now and many public health officials and biologists are aggressively pursuing avenues for our safety. There is a stepwise developmental process that will lead us to our experiences this fall, as well as many opportunities to ameliorate the situation. As Mercury first reached the heart of the pattern it triggers (the third week of April), torture memos and reports began peeling off like layers on an onion. As Mercury stations, the hits just keep on coming! I will watch this process with fascination and hope for justice. Mercury stations on Franken’s Sun-Mars conjunction — oh, my! But the only misstep has been Specter’s. The sole news item on Franken as this planetary moment passes is the heckler that got politely dissed by Franken at a Washington restaurant Tuesday night. So far, he’s clean! Yesterday, the Bureau of Land Management released reports that Quaterra Alaska Inc. has been authorized to engage in uranium exploration near the Grand Canyon, in direct defiance of a congressional resolution prohibiting such mining for three years. Environmental groups, canyon-country lovers, and people that like to drink water in California are evaluating what to do about this. There is already a lawsuit in the courts against previous interior secretary Kempthorne. To take action on this situation, contact your senators and congressional representative, urging them to enforce the emergency resolution of the House Natural Resources Committee, and to pass the Grand Canyon Watersheds Protection Act of 2009. This bill has not yet been numbered by the House or Senate. Stay in touch with the Center for Biological Diversity and the Grand Canyon Trust for how you can take political action. Here's to Your Health (and Good Luck With That)! The chair of the Senate Finance Committee Max Baucus held his first hearing on health care reform yesterday, and he specifically and pointedly excluded anyone who was interested in or advocating a single-payer plan. Fully represented among the 15 participants were health insurers and big pharma. Eight people representing groups advocating for a single-payer system attended, but when they each, one by one, stood to comment on the exclusion, they were led from the room. At least 59% (AMA) and by some estimations more than 80% of physicians favor a single payer system. At least 60% of Americans do. Senator Baucus receives more campaign funding from insurers and big pharma than any other senator. We need Mercury retrograde (and Ed Schultz on MSNBC's Big Ed Show) to raise awareness and give us time to get it right. The unifying theme of the coming six weeks (an over-arching theme of the year) is wounding, healing, and dreaming. We in America are busy healing the American Dream, removing the materialism that has tainted it in the last 30 or so years, and the anti-populism that has existed longer than that. We citizens are the key. We have to become involved in our government, or we will lose even more of what the founding fathers established for us. Healing the dream means taking the lead in some areas of human evolution simply because we can, so we must step into that responsibility with wisdom and conscientiousness. Whether it is in public health policy, land management, restoring civil liberties, or letting the people’s will be done, we are discovering the wounds (painful) and have the opportunity to heal them (joyful) as Mercury makes its way backward for the next three weeks.